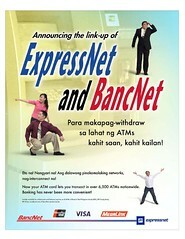 It was once featured in Deuts Top Stories the link-up between the two ATM networks, namely; Bancnet and Expressnet. The interconnection between the two networks has been in the news (broken link, thanks to inconsistent Manila Times online) since June 21, 2006, yet I didn’t have the opportunity to try to withdraw in any expressnet affiliated banks (e.g., BPI, BDO, HSBC, Landbank) until yesterday. Since 1993, there has been an alliance between Bancnet and Megalink, while Megalink made an alliance with Expressnet in 1997. Transactions made between these interconnected netwoks are charged with service fees that vary between PhP2.50 to PhP12.00 (depending on the bank) against the ATM cardholders. Transactions, however, between Bancnet and Expressnet were used to be charged US$3.50 service fee per transaction. Metrobank E.T. cardholders, especially, were explicitly warned about these charges. You’ll find these warnings posted in Metrobank ATM booths. I didn’t plan, though, to try and withdraw and see for myself how much the new service charge is. It just so happned yesterday that I didn’t have a choice. And transaction fee….PhP10.00. This sharing of network infrastructure is a strategic move that is expected to reduce transaction costs, which in turn would translate to lower service fees for all ATM-related transactions. Well, this definitely is good news to everyone. Posted on July 24, 2006 by deuts. This entry was posted in Internet and Technology and tagged Bancnet, Banking, Banks, Expressnet, Philippine Banking. Bookmark the permalink. I have the same sentiment and until now i am still afraid of using express net machines. Would you mind PSBank is charging P2.50 per transactions before, now it’s already P10. Gosh!